You have added Floral Fantasy Halter Dress in Navy into shopping cart. 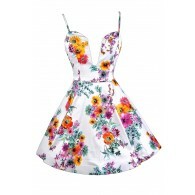 You will be in a fantasy world of floral with this adorable halter dress! The Floral Fantasy Halter Dress is fully lined. The neckline is an open halter top with an adjustable strap that goes down each shoulder to tie to the attached skirt. This dress has a halter top, empire waist, A-line cut, and adjustable shoulder strap tie. It is made of flowy chiffon type material with a gorgeous bright floral print. A hidden back zipper completes the dress. This halter dress would be adorable on date night! Pair this with wedges and some pretty bracelets for a girly look. Details: Fully lined. Hidden back zipper. Adjustable strap/back. 100% polyester. Hand wash cold water separately. Color will bleed. Hang to dry. Small measurements: Length from bust to hemline: 27”. Bust: 32”. You have added Floral Fantasy Halter Dress in Navy into Wishlist. You have added Floral Fantasy Halter Dress in Navy for Stock Notification. 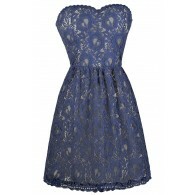 You have set Floral Fantasy Halter Dress in Navy as a loved product. 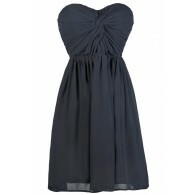 You have removed Floral Fantasy Halter Dress in Navy as a loved product.